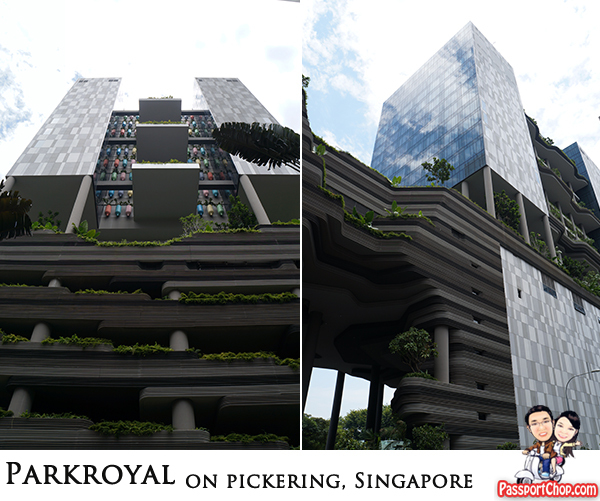 With lush sky gardens, reflecting pools and cascading vertical greenery, PARKROYAL on Pickering boasts a unique hotel-in-a-garden concept that seamlessly blends environmental principles with elements of nature throughout the property. PARKROYAL on Pickering features energy-saving elements incorporated throughout the building. Its 15,000 square metres of lush sky gardens, planter terraces, waterfalls and cascading vertical greenery comprise twice its land area. The hotel’s green features include rainwater harvesting, automatic sensors to regulate energy and water usage, and solar cells that power landscape lighting. The hotel’s unique architecture and design elements had won it Hotel of the Year by World Architecture News (WAN) in the prestigious annual WAN Awards. PARKROYAL on Pickering’s sustainable project design and green efforts have already earned it the BCA Green Mark Platinum, Singapore’s highest green rating, as well as the Solar Pioneer Award for its innovative solar energy system. The award also follows on from PARKROYAL on Pickering’s recent finalist status in the Luxury/Upscale Hotel section, in the Hospitality Design (HD) Awards 2013. The HD Awards honour the very best in hospitality design, from hotels and resorts to restaurants and bars. PARKROYAL on Pickering’s 367 elegant and contemporary hotel rooms and suites offer abundant light, innovative fixtures and sleek interior furnishings. All the rooms feature elemental wood and stone finishes for a natural feel, seamlessly blending nature from the outside into the interior spaces. Our room itself looked like something right out of those interior design magazines – in fact, if you are thinking about renovating your house e.g. how you can maximise room usage (with hidden compartments) and yet ensure that your bedroom looks good – do consider a staycation here at PARKROYAL on Pickering to “steal” some ideas! For business/corporate travellers, the large work desk and the ergonomic Herman Miller desk chair in PARKROYAL on Pickering rooms are good features to have; the in-room Nespresso coffee machine (with capsules included too) is definitely useful if you need to work late at night. There is also complimentary high speed broadband Wi-Fi Internet access and complimentary in-house movie and cable channels (via the 40 inch cable/satellite television). 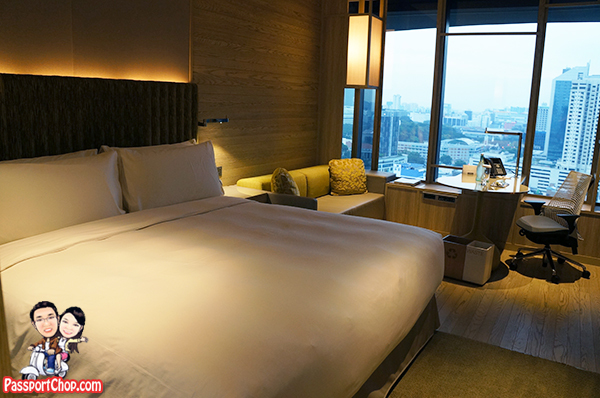 Our Orchid Club Deluxe room comes with a spacious king-sized bed and offers tranquil views of the sky gardens as well as Singapore River Clarke Quay and Boat Quay from the floor-to-ceiling windows. The bathroom/vanity area/toilet is another area that looks straight out of an interior design magazine! You can chill out in the spacious bathtubs (most hotel bathtubs are quite short in length because of space constraints but the one in selected PARKROYAL on Pickering offers more than space – that is if you are 1.75m tall). Here, you can find how the hotel creatively uses nature-inspired materials and textures such as light and dark wood, pebbles, water, and glass in its interior design. A soothing colour palette of calm greens and natural wood, accented with abundant light, provides a relaxed and tranquil atmosphere for guests throughout their stay. 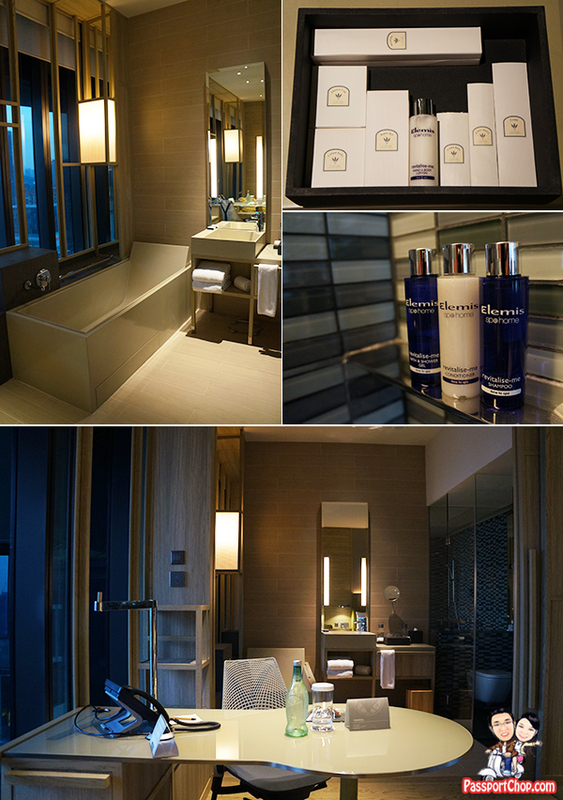 Guests will also get to enjoy Elemis shower amenities. Elemis is a premium U.K. spa and skincare brand renowned for combining natural active ingredients with cutting-edge technology to develop some of the most effective and influential anti-ageing products and professional spa-therapies the industry has ever seen. We are not experts in skincare products but these Elemis amenities sure smell really good! Occupying the PARKROYAL on Pickering hotel’s top floors, the exclusive Orchid Club Lounge heightens the experience of a staycation here with a stunning 360-degree city views and a refreshing environment for complimentary daily breakfast. Here you can mingle with fellow guests at the large communal table or choose a more private setting at one of the tables by the window. You can also unwind with complimentary cocktails and canapés at the private rooftop terraces overlooking Singapore city. Equipped with private meeting spaces and dedicated Club Concierge service, guests staying on Club floors will also enjoy a host of privileges such as champagne breakfast, evening cocktails and canapés (6pm to 8pm), all-day refreshments as well as priority check-in and check-out service. Club guests are allowed to invite one guest up at no additional charge. PARKROYAL on Pickering boasts over 15,000 square metres of lush four-storey tall sky-gardens, reflecting pools, waterfalls, planter terraces and cascading vertical greenery, amounting to twice its land area. Set outdoors amidst landscaping and waterfalls, the 5th floor is a dedicated wellness space which incorporates fitness and recreational facilities including an infinity pool overlooking the city, jacuzzi, fitness centre, outdoor terrace and a 300-metre garden walk. 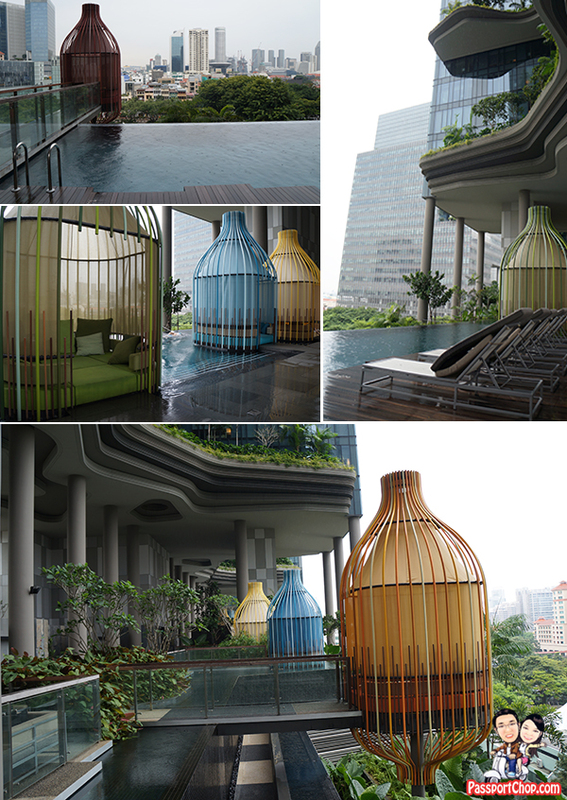 Colourful birdcage-shaped cabanas are positioned around the pool area, providing comfortable chill-out spaces. Here, you can take a relaxing dip in the terrace infinity pool then lie back in the comfort of the unique cabanas while taking in spectacular sunset views over Singapore River. You can also do an energising workout in the hotel’s fitness centre (a very well-equipped gym) or take a leisurely stroll along the hotel’s 300-metre Garden Walk or just relax with an invigorating spa session at the award-winning St. Gregory. Lime, the hotel’s signature open-kitchen concept, is an all-day dining restaurant which serves up a diverse range of Asian flavours and contemporary international favourites in lively theatrical fashion. Housed within the restaurant is a street-level bar, an ideal place to relax and unwind with a variety of classic cocktails, specialty wines and tapas-style snacks. 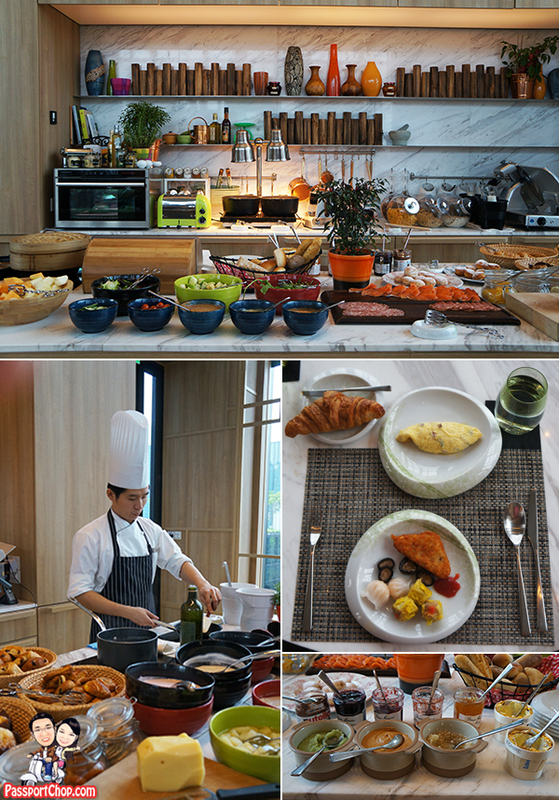 One highlight of Lime is its Sunday champagne buffet brunch – you can check out our review in a subsequent blog post. 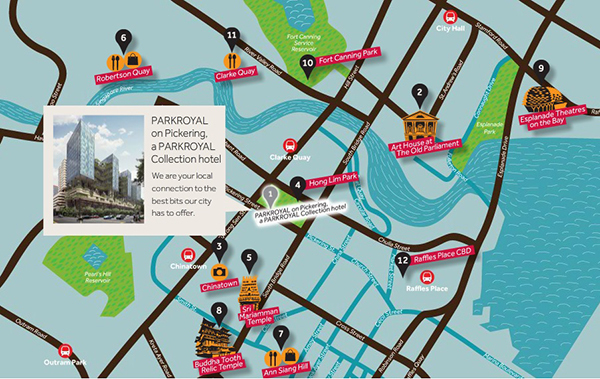 PARKROYAL on Pickering Hotel is located at the key gateways to Singapore’s central business district, Hong Lim Park and bustling Chinatown. Hotel guests have convenient access to waterfront entertainment and dining options along the Singapore River e.g. Clarke Quay and Boat Quay as well as cultural gems across the island. Walk out of the lobby of PARKROYAL on Pickering Hotel and you are in Chinatown! Bound by Upper Pickering Street, Cantonment Road, New Bridge Road and South Bridge Road, the crowded and colourful network of streets and alleyways is the signature look of this area. Here, merchants hawk their wares from the ground floor of quaint pre-war shophouses, from delicate bales of silk and gold jewellery to Singapore t-shirts and traditional crafts.